A number of residential estates and business parks have installed access control systems which aim to control the passage of pedestrian and vehicular traffic into and out of the facilities. However, without the addition of a suitable visitor management system that accurately records and monitors visitors, one is missing a vital link in the chain of access control solutions. This is according to John Powell, CEO of Powell Tronics, who says that the company’s PT-GUEST and PT-Scan visitor management solutions have been successfully adopted at a number of security estates throughout the country. PT-GUEST is directly integrated to Impro’s IXP400 ImproNet and the new Portal range of access control systems. This visitor management solution includes a portable barcode scanner, which scans an individual’s drivers’ licence, and a car registration disk scanner, with all data downloaded via Wi-Fi directly to an encrypted database on-site, thereby eliminating transactional running fees which are often incurred with cloud-based systems. PT-GUEST allows estate managers to accurately identify exactly who is on site at a specific time and results in controlled traffic flow at the perimeter. “In addition, the system provides valuable marketing information for estates. This is especially pertinent where the estate is not only reserved for the use of residents but, for example, may play host to wine tasting, events, golf days and so forth. The reports provided will indicate busy periods and specific zones (for example the golf course, or the conference room or restaurant) which are being visited and how many people are visiting those particular zones over a specific time period,” says Powell. Attention to the changing needs of users is a major differentiator for Powell Tronics and has been a primary factor in the growing adoption of its visitor management solutions. The company recently announced that its PT-GUEST program will be moving to an Android device which has a large screen, with built-in barcode scanner. With a similar look and feel to a mobile phone, the unit is versatile and user friendly. Powell says that the updated mobile app available with PT-GUEST allows for much faster and easier preregistration of visitors by a registered user. This can also be done by means of the web interface. The design criteria on its latest release were attention to detail, simplicity of operation for the users and security of all data by encryption, for guaranteed security. 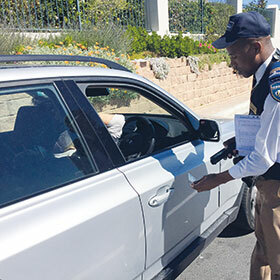 “We are working towards making visitor management readily available no matter where one needs to verify and monitor visitor access and movement on an estate or facility. Customisation of solutions is one of our hallmarks,” says Powell.